The Allstate Foundation has awarded a $35,000 grant to support the library’s Allstate Readiness Series, a year-long series providing programs on Teen Safe Driving and Financial Empowerment for women, particularly survivors of domestic violence. For more information on this series, visit www.readinessbeginswithme.org or call Lori Abbatepaolo at 585-9393 ext. 295. 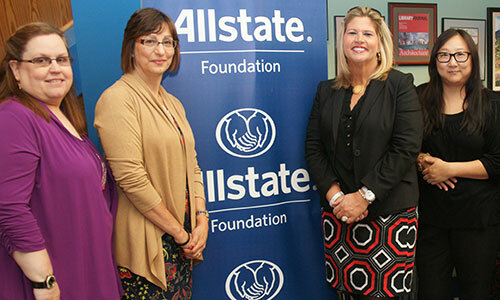 Pictured l-r: Sue Bohrer-Braun and Michele Martin, Allstate agents; Allison McMahon, regional division manager, Allstate Foundation and Sara Fade, librarian.